Petroleum & chemical storage tanks represent a significant source of environmental releases. AWT is capable of cleaning & removing underground or above ground tanks & their contents. AWT is also capable of handling discharges to the soil & ground water, including full remediation & restoration. AWT’s crews are fully trained with OSHA health & safety, purging & inerting techniques, confined space entry, excavation & tank regulations. AWT handles not only oil & gasoline tanks, but those containing flammable solvents, chlorinated organics, oxidizers & a range of chemical products. 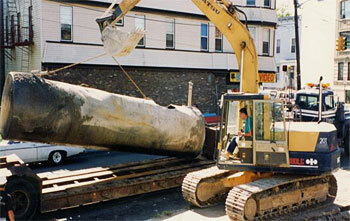 We have removed tanks ranging from 275 to 125,000 gallons, comprised of steel, fiberglass, concrete & other materials. When you consider the myriad of potential hazards emanating from tank storage, it pays to deal with a contractor who is dedicated to protection of the environment & customer needs.